Personalized 19" High Vertical Address Sign - - 4"W x 19"H vertical address sign. Wall mount only. Made in USA. 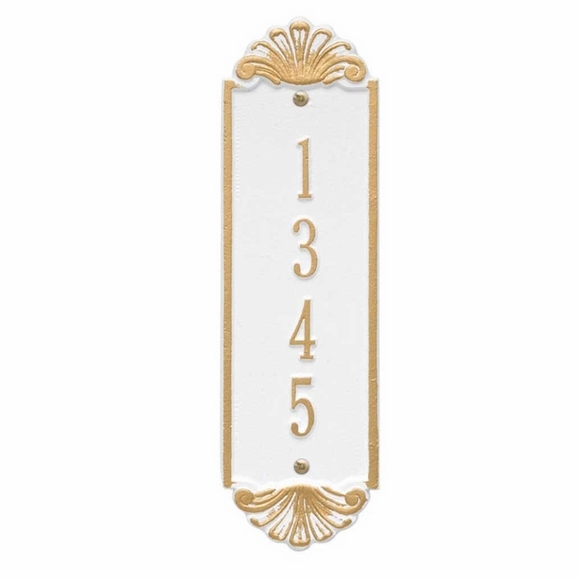 Tall and narrow sign holds up to five 3" numbers or up to seven 1.75" characters. Shell Vertical with shell motif (main image). Shown in white/gold. Richmond Vertical with arch accents top and bottom (first small image). Shown in black/gold. Norfolk Vertical with pointed accents (middle small image. Shown in black/gold. Lyon Vertical with fleur-di-lis accents (last small image). Shown in black/gold. 4" x 19" vertical address sign can hold up to seven characters. The sign was even better than I expected. Fit perfectly and looks great on my porch.